Today, August 21, 2017, a total eclipse of the Sun will be visible across the U.S. tracing out a 70-mile-wide band across 14 states. Beyond their rarity and otherworldly nature, solar eclipses help astronomers better understand the Sun – its structure, inner workings and the space weather it generates. They also provide an opportunity for researchers who study solar science to forecast in advance how the Sun will look during the eclipse – proving their predictive chops, so to speak. A team from Predictive Science Inc. (PSI), based in San Diego, is one such research group. Beginning on July 28, 2017, with support from NASA, the Air Force Office of Scientific Research and the National Science Foundation, they began a large-scale simulation of the Sun’s surface in preparation for a prediction of what the solar corona — the aura of plasma that surrounds the sun and extends millions of kilometers into space — will look like during this eclipse. By tracing magnetic field lines at extremely high resolution, researchers can calculate a 3-D map of the so-called magnetic squashing factor shown above– a scientific measure designed to indicate the presence of complex structuring in the magnetic field. The researchers then integrate the map along the line-of-sight, with special weightings to create a composite that resembles solar eclipse images. This is intended to highlight the inherent complexity of the Sun’s magnetic field and its intimate connection to visible emission from the solar corona. 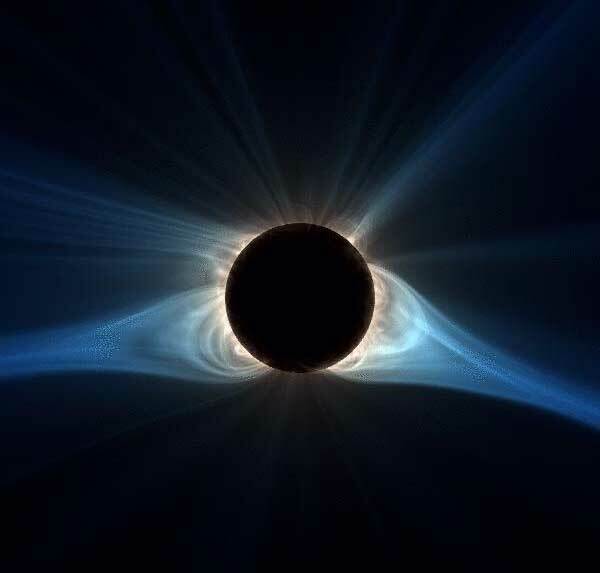 The final prediction of the solar corona for the August 21, 2017 total solar eclipse is shown below, developed by researchers at Predictive Science Inc. 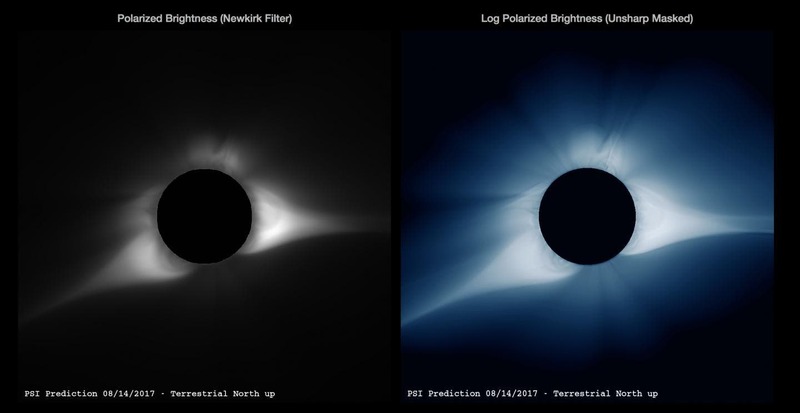 The images show two versions of the predicted brightness of polarized white light in the corona. The left image shows an image processed to simulate what would be seen when using a “Newkirk” radially graded filter. The image on the right is the polarized brightness on a log scale, sharpened using an “Unsharp Mask” filter. These are two different attempts to approximate what the human eye might see during the solar eclipse. Using massive supercomputers, including Stampede2 at the Texas Advanced Computing Center (TACC), Comet at the San Diego Supercomputer Center (SDSC), and NASA’s Pleiades supercomputer, the researchers completed a series highly-detailed solar simulations timed to the moment of the eclipse. The image above on the left shows a digitally processed version of the polarized brightness using a ‘Wavelet’ filter to bring out the details in the image. The image on the right shows traces of selected magnetic field lines from the model. The team used data collected by the Helioseismic and Magnetic Imager (HMI) aboard NASA’s Solar Dynamics Observatory (SDO), as well as a combination of magnetic field maps, solar rotation rates and cutting-edge mathematical models of how magnetohydrodynamics (or the interplay of electrically conducting fluids like plasmas and powerful magnetic field) impact the corona. Time on Stampede2 and Comet was provided by the Extreme Science and Engineering Discovery Environment (XSEDE), a collection of integrated advanced digital resources available to U.S. researchers. The research team completed their initial forecasts on July 31, 2017, and published their final predictions using newer magnetic field data on their website on August 15, 2017. They will present their results at the Solar Physics Division (SPD) meeting of the American Astronomical Society (AAS) from Aug. 22-24. 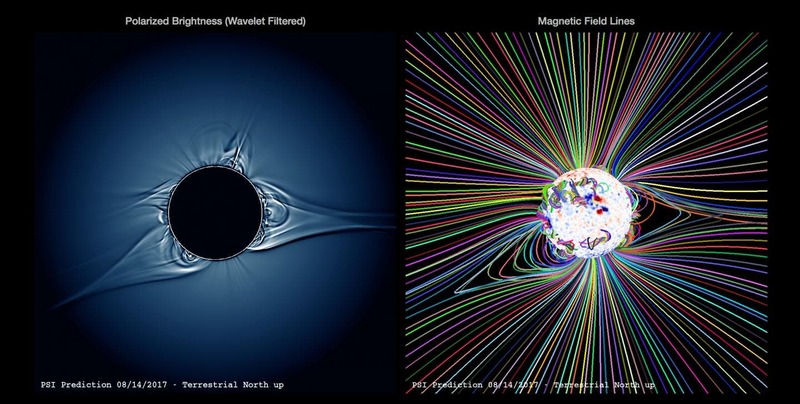 The magnetohydrodynamic model of the solar corona the researchers used included an improved treatment of energy transport. While previous predictions in 2006 and 2008 incorporated a more simplistic heating formalism, PSI’s researchers this time applied a wave turbulence-driven methodology to heat the corona. This model better reproduces the underlying physical processes in the corona and has the potential to produce a more accurate eclipse prediction. For the final prediction, they also introduced magnetic shear, a well-known feature of large-scale coronal magnetic fields that has not been accounted for in past predictions. The inclusion of shear qualitatively changes the shape of the streamers and the connectivity of the underlying fields, and increases the free magnetic energy in the corona. One of the team’s simulations even produced a coronal mass ejection (an unusually large release of plasma and magnetic fields from the solar corona) from an active region that will be near the east limb of the Sun on eclipse day – a tantalizing possibility for eclipse watchers. The simulations are among the largest the research group has performed, using 65 million grid points to provide greater accuracy and realism. Once completed, the researchers converted their computer simulations into scientific visualizations that approximate what the human eye might see during the solar eclipse. Making predictions about the appearance of the corona during an eclipse is a way to test complex, three-dimensional computational models of the sun against visible reality. But the endeavor also has a practical purpose beyond the moments of an eclipse. Accurate predictions of space weather can potentially help authorities prevent the worst impacts of a powerful solar storm, like the one in 1859 — known as the Carrington Event — whose auroras were visible as far south as the Caribbean and which caused telegraphs to short and catch fire. According to a 2008 report by the National Academy of Sciences, if such a storm were to hit the Earth today, it would cause more than $2 trillion in damages. Predicting the arrival of such a solar storm in advance and taking the most critical electronic infrastructure offline could limit its impact. But doing so means understanding how the visible surface of the sun (the corona) relates to the mass ejections of plasma that cause space weather. “The ability to more accurately model solar plasmas, helps reduce the impacts of space weather on key pieces of infrastructure that drive today’s digital world,” Gaffney says. With each accurate prediction of the corona during a solar eclipse, scientists take a step closer to preparing for that terrible possibility.